Legend has it that the Cymric—hard “c,” rhymes with limerick—lost her tail while scurrying to make it onto Noah's ark at the very last minute. (So it's her fault the unicorns didn't make it on board, we guess.) The less scripturally inclined among us attribute the absence of tail to a genetic mutation common among cats on the Isle of Man. 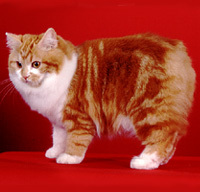 This furball looks a lot like the Manx cat with a blowout: the Cymric's fur is long, while the Manx cat's is short. Both breeds hail from the Isle of Man, which is just south of the land that gave this kitty her name. “Cymric” comes from “Cymru,” which is “Wales” in Welsh. This breed can grow to between 8-12 pounds. WHAT IS THE CYMRIC'S PERSONALITY LIKE? Cymrics are gentle, playful, and very intelligent. Don't be surprised if yours figures out doorknobs if there's something she wants on the other side of that door. This breed usually gets along well with dogs and children, if properly socialized. WHAT IS CYMRIC BEHAVIOR LIKE? Cymrics can be a bit dog-like in that they often enjoy playing retrieving games and will sometimes bury their toys. While their voices are quiet, they're surprisingly chatty and will make a trilling sound to let you know when something's on their minds. HOW CAN I KEEP MY CYMRIC ENTERTAINED? Cymrics are avid jumpers, so having a sturdy, tall cat-tree for them to ascend is a good idea. (And keep breakables off high shelves—you'd be surprised how little room this butterball needs to land.) They also often enjoy playing with, though not being in, water. WHAT DO CYMRICS LOOK LIKE AND WHAT ARE THEIR GROOMING NEEDS? Cymrics aren't all completely tail-less (though the showcat version needs to be a “rumpy,” or completely tail-less, to compete). They mostly look like furry sweet potatoes, to be honest. Brush or comb yours a few times each week to prevent tangles and mats—more often if she's shedding. Most healthy, grown-up cats won't need regular baths in addition to their own grooming routines—though if your cat is older, you might want to do some research on helping her keep up appearances. WHAT HEALTH PROBLEMS DO CYMRICS HAVE? Cymrics can sometimes be prone to spinal defects, which can result in problems walking, urinating, or defecating. These symptoms usually manifest within the first six months. Because of potential genetic complications, your Cymric should not be bred with another tail-less cat. ARE CYMRICS GOOD FOR PEOPLE WITH ALLERGIES? Cymrics aren't among the breeds generally recommended for allergy sufferers. Remember that no breed is 100% hypoallergenic, and any breed can aggravate allergies. You can reduce your furry friend's impact on your allergies with daily brushings. If your pet allergies are mild, a regular grooming session could have a big impact on your quality of life with your pet. WHAT IS MY CYMRIC'S BEST DAY? Find her something tall to hop on, a faucet to splash at, a puzzle to outsmart, and a lap to sit in—purrs are guaranteed. To really keep your Cymric on her toes, consider leaving a tap dripping so she can bat at it. And you might think about clearing off some high shelves, so that she won't knock things over while she explores your home's stratosphere. Or maybe even put in a climbing system, which will let your favorite fuzzball walk along your walls instead of (figuratively) climbing them. SHOULD I ADOPT A CYMRIC? Cymrics are smart, quiet, gentle cats who have lots of energy and love to give. If you're home often enough to keep her company, this feline is a fine furry friend. Have you decided that a Cymric is the purr-fect cat for you? Why not be your new best friend's hero and adopt a rescue! Be sure to check out our article on what to expect when you're adopting a dog or cat.